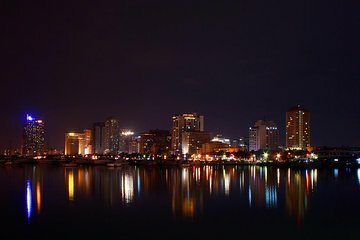 Experience the nightlife of Manila with a private guide at the helm. Start your evening with a delicious gourmet dinner while you watch a local performance. Afterward, you're accompanied to two bars for a different style of entertainment. Private transport is provided round-trip from your hotel, with the option of drop-off at a disco or casino. Start your night tour of Manila with private pickup from your hotel. First, experience Filipino hospitality with a delectable feast of specialty dishes for dinner. You'll partake in a typical 'barrio fiesta,' or neighborhood party, and soak up the festive atmosphere and local talent during a live performance. Then set off with your personal guide to explore the city after sundown. Visit a couple of different bars that showcase various sides of Manila’s exciting nightlife. At the end of the tour you will be taken back to your hotel, or you may opt to be dropped off at a disco or casino. Alternatively, walk along rows of night entertainment in Malate or Makati on the way back to your starting point.